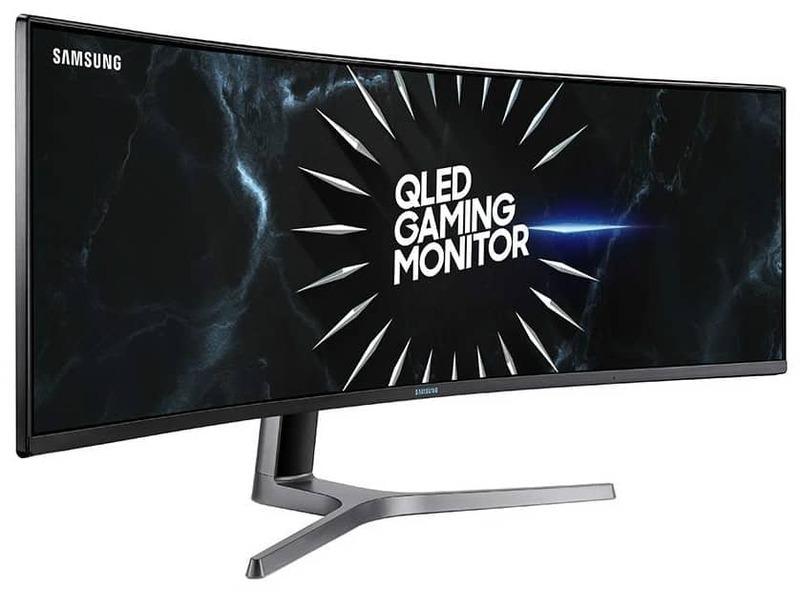 The Samsung C49RG90 is the latest evolution in the crazy-popular super ultrawide segment which includes the best specifications the industry has to offer. The massive, 32:9 screen offers a 120Hz refresh rate alongside its equally humongous resolution, then pumps it up with VESA DisplayHDR 1000 capabilities for gorgeous visuals. The Samsung C49HRG90 won’t come cheap, but its one of the few you can invest in to enjoy the very best PC gaming has to offer. The Samsung C49RG90 doesn’t try to mutate the brand’s current aesthetic direction with something new or gamer-ish which is a good thing in our opinion. The chassis has an all-matte black finish that is stylized with clean lines and an overall minimalist appearance. The screen isn’t bezel-free, but the sides and top have thin borders thanks to a dual-stage design. The rear of the chassis has a smooth, matte surface which gives the Samsung C49RG90 a very clean look. The brand isn’t one of those who designs their gamer-specific products with aggressiveness and decorations which some may like, but many find to be tacky. You will find a circular indent at the middle which doubles as the stand’s attachment point and a decorative feature. This part includes an LED ring that glows blue which can be synchronized to your PC’s audio output. You can set it to static or turn it off, but unfortunately, its color is fixed. The most notable characteristic of the Samsung C49RG90 is its massive size which four feet of desk space plus some allowance. The display is expansive due to its 32:9 aspect ratio which is comparable to two 27-inch 1440p monitors side by side minus the bezels. It’s great for multitasking and immersive gaming, but a visit to Ikea or something similar for a new desk might be required. We like that Samsung opted to place the OSD joystick centrally at the bottom bezel for easy access. Most of their designs have the controller at the corner, and we imagine it would be very hard to reach on a monitor of this width. The Samsung C49RG90 is supported by a flexible stand that has a penguin-feet shaped stand that should offer sufficient stability to the massive device. You can tilt, swivel, and adjust the cabinet’s height, but this part requires more than a foot of depth on your desktop. That shouldn’t be an issue for most, but some users with keyboard wrist rests might have difficulty placing the peripherals comfortably. The I/O layout on the Samsung C49RG90 is decently equipped and is neatly tucked behind a cover that conceals and streamlines cables via a reasonably-sized tidy hole. The panel includes dual DisplayPort 1.4 and a single HDMI 2.0 slot for video inputs, along with a total of five USB 3.0 slots for peripherals. The monitor doesn’t have speakers, but it includes a 3.5mm jack for audio passthrough. The Samsung C49RG90 boasts a 49-inch SVA panel with a 5120 x 1440 DQHD resolution, a 120Hz refresh rate, and a 4ms minimum response time. A contrast ratio of 3000:1 is also listed, but what makes this variant special is its 600cd/m2 backlight which can pulse to 1000cd/m2 when it’s needed for HDR visuals. 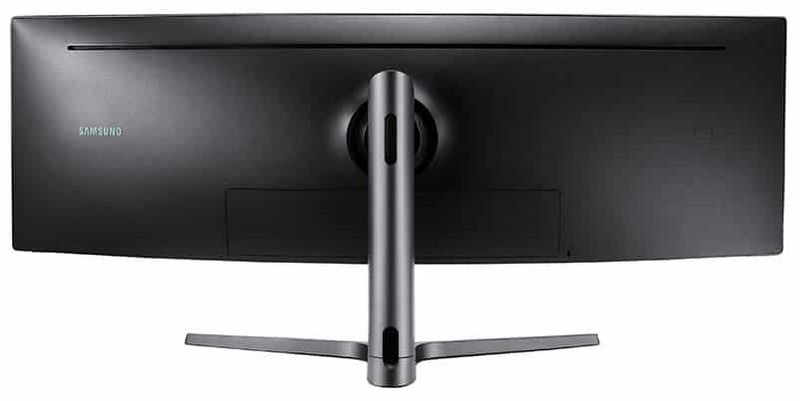 The monitor qualifies for VESA’s DisplayHDR 1000 specifications which indicates that it will offer the best possible HDR quality for PC monitors. The Samsung C49RG90 also comes equipped with Quantum Dot technology which should enable its 125% sRGB/95% DCI-P3 gamut coverage. As we all know, DisplayHDR 1000 requires a substantial color reproduction output for its effects to be fully realized. The module used is compatible with 10-bit color, but it will most likely be 8-bit with FRC. We can expect deep and vibrant colors along with rich and inky blacks that makes stunning eye-candy or any kind of game. We’re also hoping that the monitor can offer superb accuracy by default or by calibration so users can also utilize the Samsung C49RG90 for professional endeavors. The screen diagonal is fantastic for gaming, but it’s also highly suitable for optimizing workflows and multitasking. This kind of monitor’s sharpness is comparable to a 27-inch QHD display but is nowhere near 4K screens when it comes to details. However, that’s a great thing since the screen won’t be as taxing as a 4K display, making it easier to maximize the refresh rate. You still need a top-end card to power this beast, but we think that’s a reasonable requirement for a massive display that wraps itself around your visual senses. The Samsung C49RG90 also comes with gaming features such as a Low Input Lag mode for reducing latency incurred by non-critical processes. This model will also ship with FreeSync 2 compatibility which was designed for HDR gaming, but G-Sync compatibility remains unconfirmed at this time. The monitor’s functional range is also unspecified, but 120Hz can accommodate LFC or Low Framerate Compensation for massive frame drops. 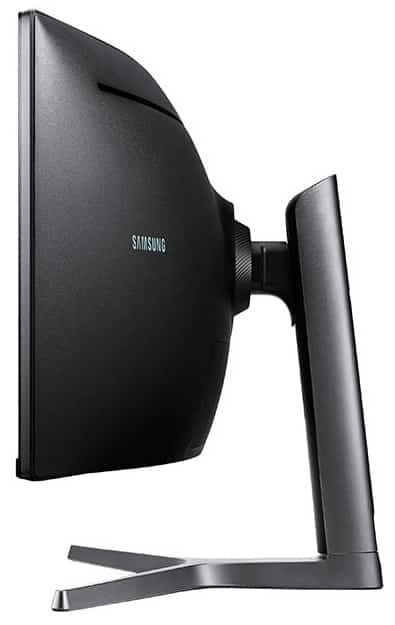 The Samsung C49RG90 is one of the more exciting super ultrawides we are looking forward to reviewing due to its combination of DisplayHDR 1000 capabilities and a high refresh rate. There are only a few models that can offer that kind of performance, but they are limited to a 16:9 ratio which pales in comparison when FOVs or field of views are considered. This kind of PC display is also suitable for multitasking, making it easier to justify the purchase to your significant other. The Samsung C49RG90 is expected to go on sale by May of this year with an initial SRP of $1500. To be honest, that’s a very fair price for this device, but expect it to drop considerably when supply and demand stabilizes. We will update this article once more information becomes available, but you can also visit the product’s official page by clicking this link.